I did not see a thread for this game and decided to make one. It is also not in the games list on the site or in the perfect on dolphin spreadsheet. Status: Does not run? I have tried it with revisions 4037, 3661, and 3157 using standard settings. I have tried using Dolphin and DolphinIL and it crashes on load with just a black screen. Sometimes it will play for less than a second to display the "Licenced by Nintendo" but cannot go any farther. Im assuming that the builds in the 2xxx will not do any better but I will try if anyone has one laying around. Notes: Turning on Unlimited Jit cache does make the game load for about a second and a half now. Always showing the "Licenced by Nintendo" screen. I have been messing around with the settings and I have not found anything else that made even the slightest improvement beyond this. Feel free to duscuss THUG2 also. Currenlty Dolphin says it is broken. Same goes for Tony Hawk's American Wasteland. After I get to the "Licensed by Nintendo" screen, a slew of Backpatch errors comes up. It just crashes when panic handlers are turned off. For what it's worth, Tony Hawk's Underground 2 works. What settings are you using to get by the Backpatch errors? Try use MMU SPEED HACK and Accurate Texture Cache. What is the Game id of that game. Yeah, I've played around with that before, but it still can't get ingame. (02-02-2011, 08:56 AM)The Hero of Time Wrote: Yeah, I've played around with that before, but it still can't get ingame. 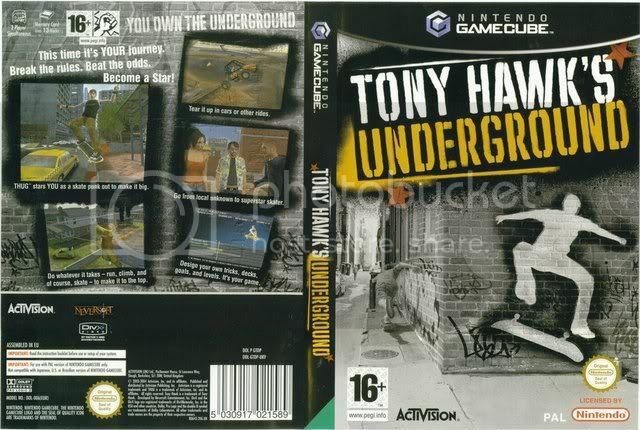 No I mean GameID of the Tony Hawk's Underground. But it is playable, only the sound was bad. Tony Hawk's Underground works for me on r7251 32bit. Apparently not many others have tested this game yet... but I didn't see any emulation issues in the first few missions. try setting xfb to virtual... sometimes this gets me past black screens on gc games. dunno why.